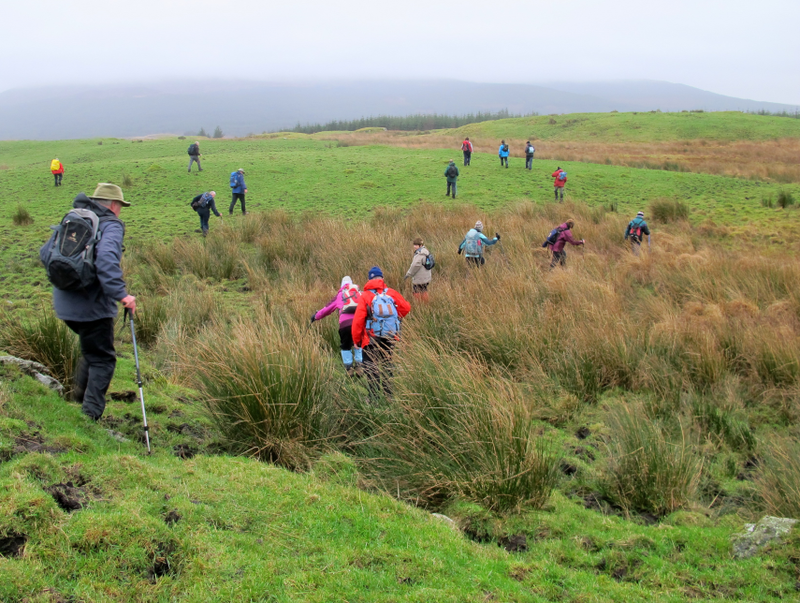 Although there had been quite a horrific weather report for the day, twenty ramblers (Thomas, Cath - leading, Frances – backup (of a sort), Rachel, Richard, Andrea, Jack, John, Peter, Duncan, Irene, Florence, Leslie, Charlotte, Ken, Mary, Christine Makepiece (Port William), Christine from Kirkcowan, and Carl) turned out for a walk through Kirroughtree woods and the Bargaly glen. 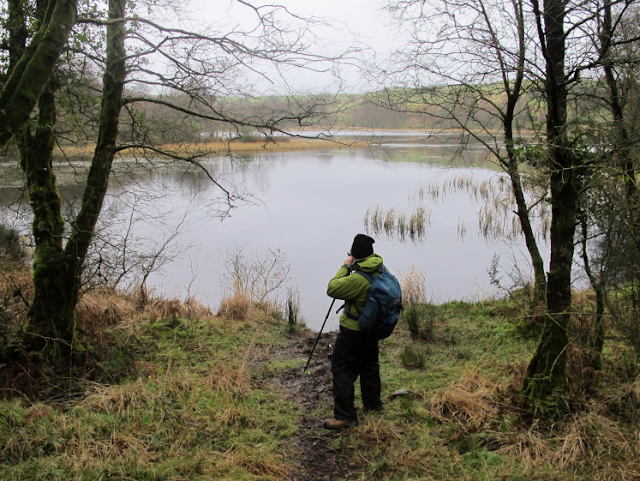 After parking at Glenamour car park the forest road was followed to a beautiful loch of the same name. 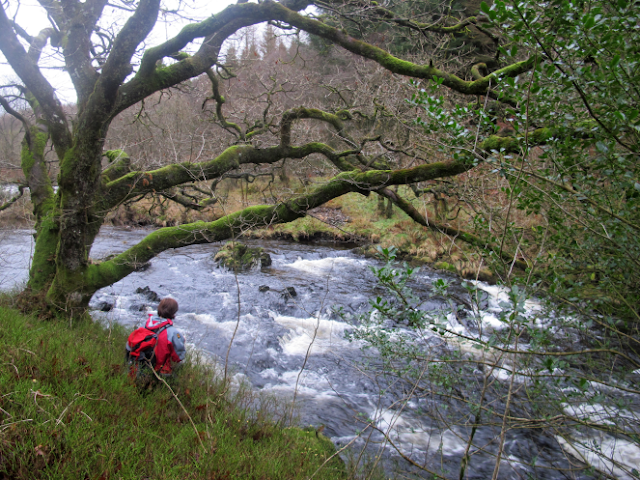 Set in a defile amongst tall trees this man made stretch of water is a quiet and hidden gem of the woods. 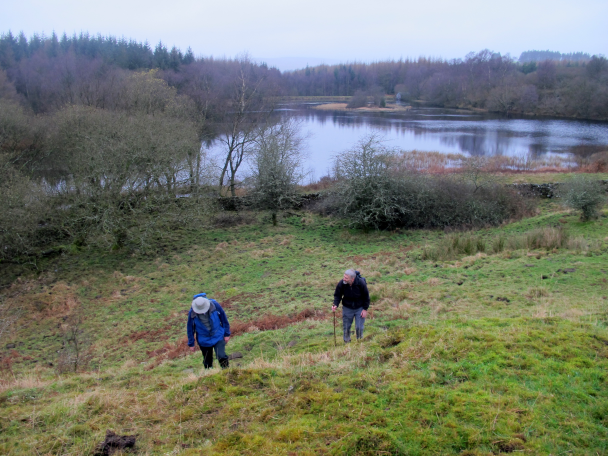 The open hill was the next objective where the views were shortened by the overcast skies, but the farm of Barncaughla could be seen clearly, where the prophet Peden stayed at one time. Underfoot the boggy ground meant stepping from tussock to tussock until the trees were entered once more; a forest track alongside the Palnure Burn eventually being reached via footpath and country road. 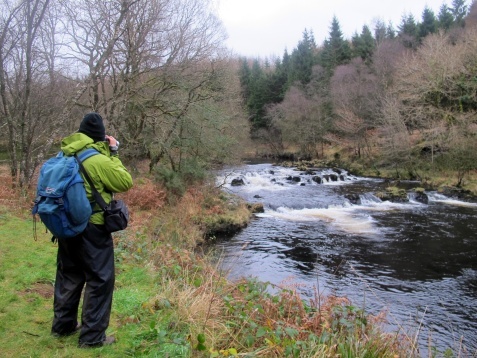 Stopping by the side of some rapids for a photo shoot, a plaque was found, inscribed with a poem portraying the delights of the Palnure burn, with an accompanying sculpture reminiscent of a ladybird. Although the weather was really dull and mizzly the water was still amazingly photogenic and I got a lot more photos there with and without the group of walkers before we headed off again. 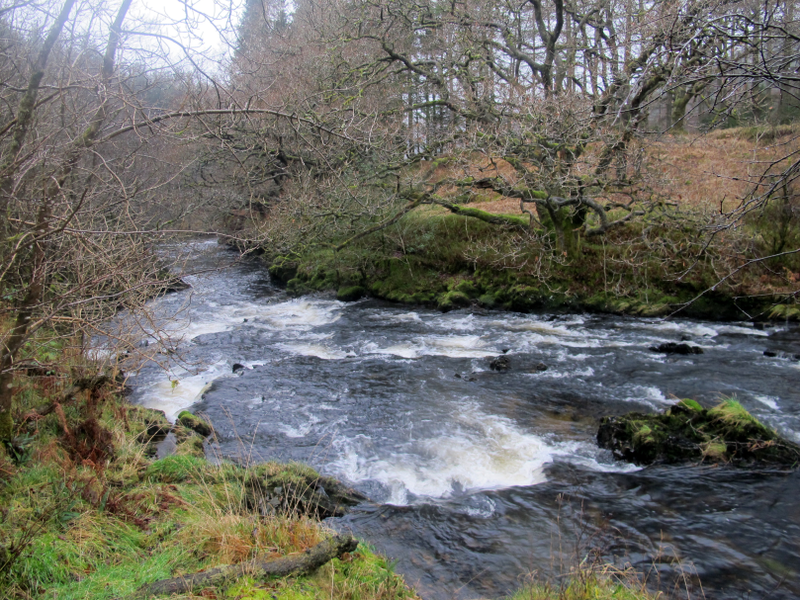 The river was followed to Dallash and crossed by a dry ford at Corwar. The farm is unfortunately no longer inhabited, a sad reminder of the demise of small farms in the hills. We turned off into the field opposite it which once was the home of many horses which had been reared there in the past. The old road was just about visible leading back alongside the Palnure, but was very wet in places and another ford had to be crossed, this time by walking through the water. 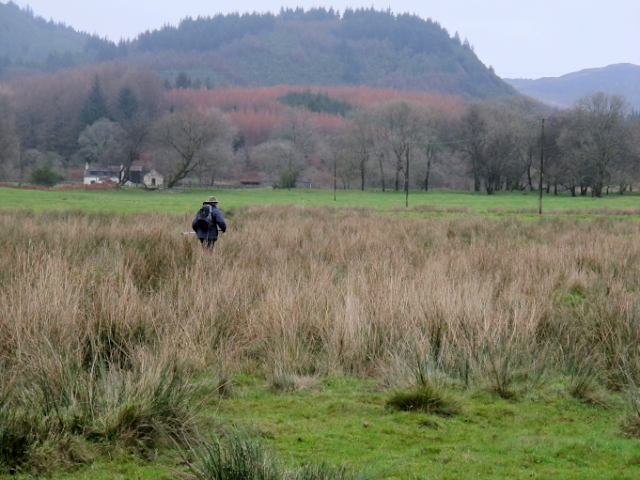 Jim found an alternative route and Ken spent ages back tracking trying to find one too, through the boggy, rushes strewn area around the burn. 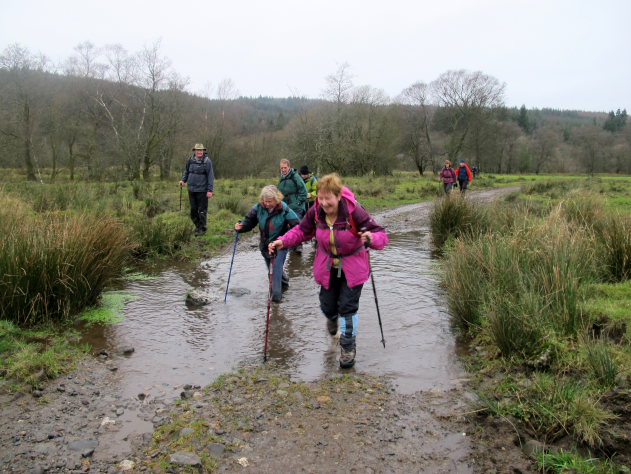 He eventually rejoined us – with wet feet! Lunch time back at the rapids, on the east side of the river, the rain began to fall. 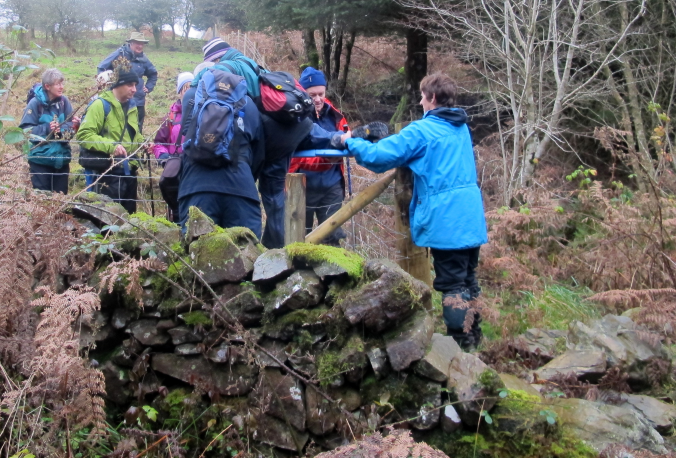 It did not dampen the enthusiasm of the walkers, who examined the memorial stone to a forestry worker, and then the shaft and adit of a lead mine close by. Belties and Shorthorns alongside the farm track leading to Bargaly farm added interest to the now wet walk, but the Visitor centre at Daltamie was soon reached. and I went into the centre for drinks and cakes. I had a huge Walnut and Cherry scone and tea, just the thing to start the process of warming me up – or so I thought. I actually got colder sitting in the centre while we waited for the others to join us and when they did I got myself another pot of tea, just to help the warming process! 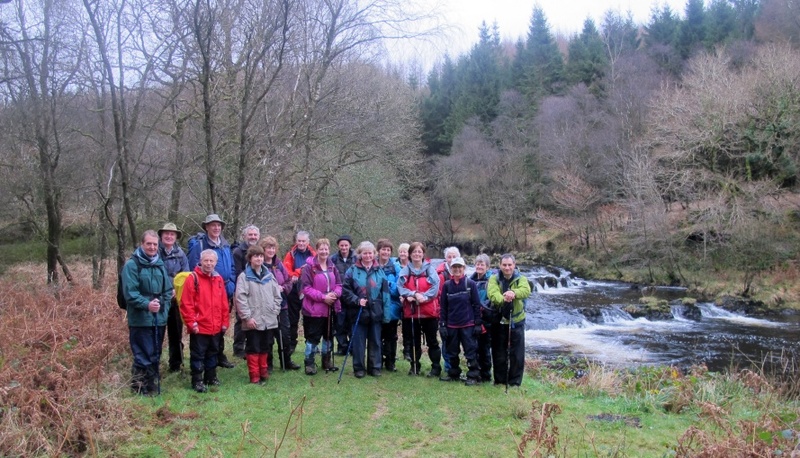 This was not the end of the walk, for now the Lade Walk, constructed with the assistance of Sulwath Connections, brought the industrial past of Kirroughtree forest to life. When the military road was being constructed in 1763 lead was discovered in the excavations. 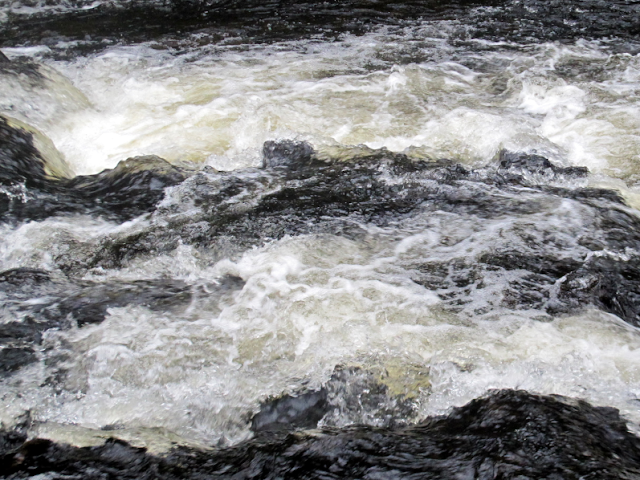 There began a period of mining here which lasted until the beginning of the twentieth century. Some of the shafts reached a depth of 900 feet. 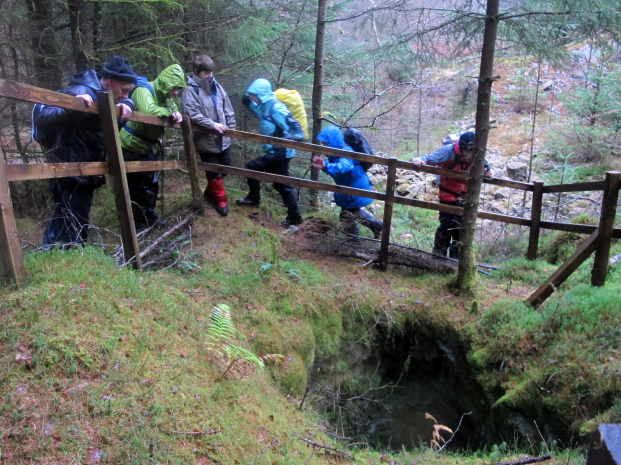 The lade walk follows the route of the water collected in Bruntis loch and travelling down to the washing floors where ores were crushed and cleaned. 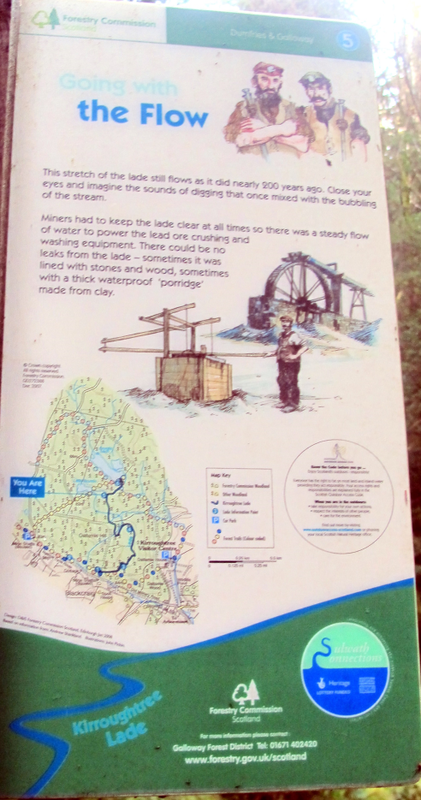 Information boards along the way point out water holding pits, bridges for farm carts to cross, the stone and clay construction of the lade itself and eventually the sluice gates where the water was released from the dam at Bruntis Loch. Both photos taken on the previous Tuesday when the sun shone ALL day! 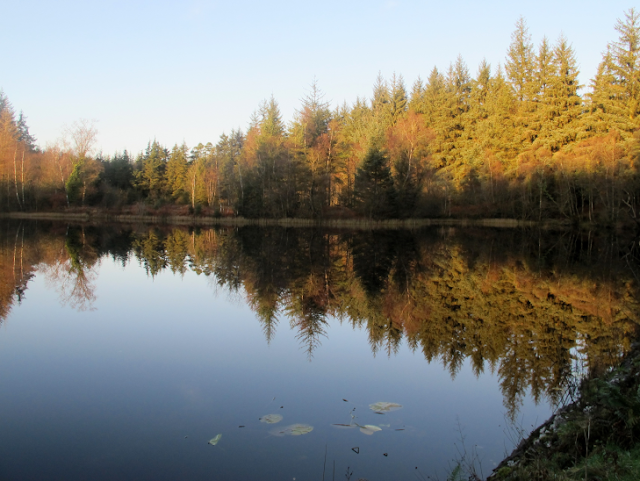 The loch is the jewel of the forest. This description is reflected by the 1.75 tons of a polished, pink quartz sculpture of a diamond, one of the Seven Stanes of the Galloway bike trail. 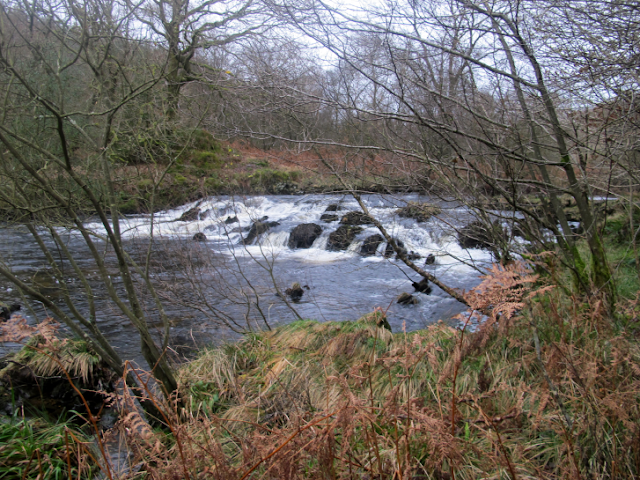 It was designed by Gordon Young and is reached across a wonderful circular bridge over the Bruntis Burn. 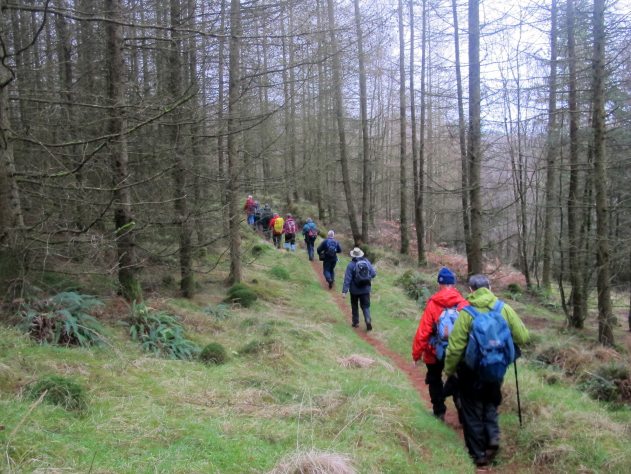 The walkers now followed this burn past a tumbling waterfall back to the Visitor centre and well-earned refreshments. 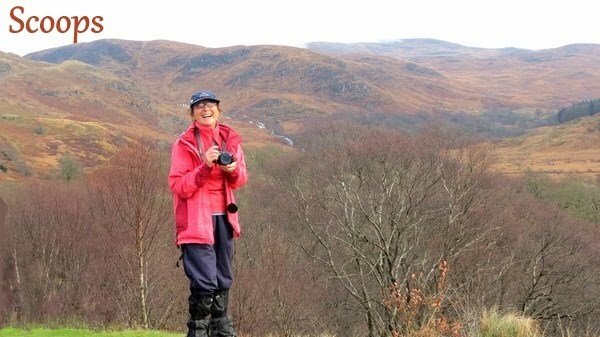 It had been an interesting and well suited walk for the short and damp days of November. Thomas had left us earlier on and walked all the way back to the start of the walk to retrieve his car so was a bit late in joining us in the Centre. He, Richard and Jim took everyone back to the start of the walk, Richard doing the ‘run’ twice – thank you all! Frances Collins. Awesome Inc. theme. Theme images by 5ugarless. Powered by Blogger.